We released our first tablet last month, the M10 Ubuntu Edition which is the first of our fully converged devices that changes the Personal Mobile Computing Experience as we know it. It has an adaptive user experience that can transform your tablet into a PC within seconds! This means greater freedom and flexibility as that bulky laptop bag can be left behind as all you’ll need is one device. With this, we want to know what your life would look like if all your computing needs fitted into one device? 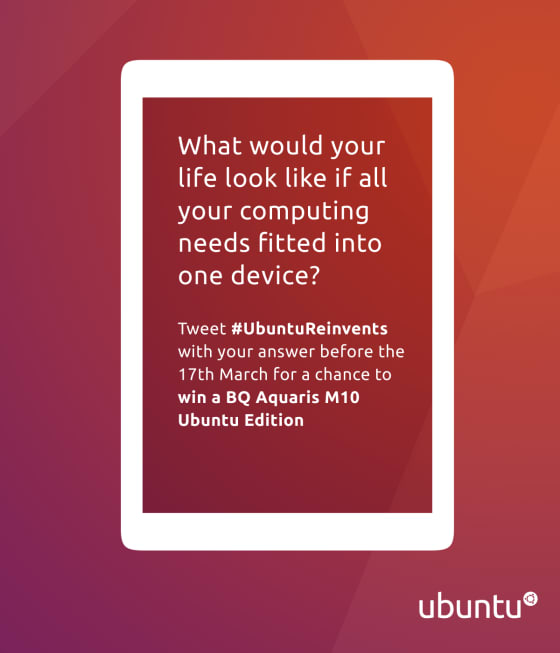 In 100 Twitter characters using the hashtag #UbuntuReinvents let us know what this means to you. Feel free to be as spontaneous, original and insightful as you please! And the selected two will win one of the first converged devices, the M10 Ubuntu Edition tablet! Entry begins on Thursday 3rd March and closes 17th March at 17:00. Happy crafting!